Chances are that if you’re reading this, there’s one smartphone feature you care more about than anything else. That’s because even with the Key2’s sleeker, more refined design, an interesting choice of components and its questionable BlackBerry heritage, this handset has one thing you simply don’t get on phones anymore: a good ‘ole physical keyboard. And I’ve got to admit that even though I’m much more accustomed to the touch-based keyboards found on every other device nowadays the Blackberry Key2's keyboard is fantastic. And while that might sound kind of obvious, you got to remember, the Key2 basically has no competition in the physical keyboard space. 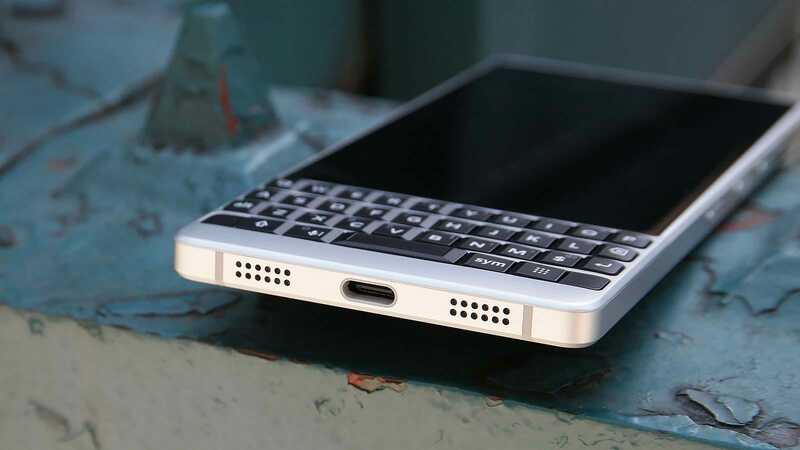 That means TCL, which bought the rights to make BlackBerry phones back in 2016, could have slacked off, knowing that people who want tactile keys would have no choice but to turn to one of TCL’s reborn line of devices. But they didn’t! 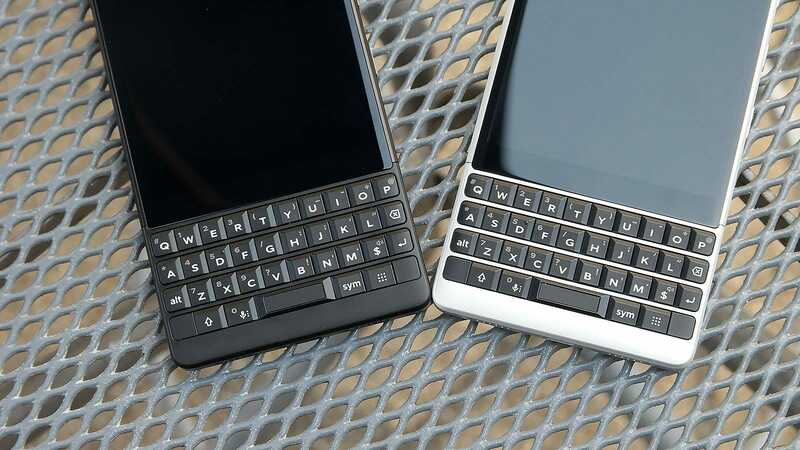 Instead, the Key2 sports a keyboard with a slightly more grippy matte finish, and a new Speed key that gives you even more ways to customize the device. So now, on top of having a total of 52 shortcuts (short and long presses for each letter key) that can be assigned to specific apps, the Speed key lets you create custom functions like texting a specific person, toggling Bluetooth on or off, or even opening an Incognito tab in Chrome. All told, that’s a staggering level of customisation, and that’s not even considering the convenience key on the side of the device, which can also be programmed to suit your needs. As for the keyboard itself, the keys are even clickier and sturdier than before, and they even have a built-in backlight so you can hammer out texts and emails even in the dark. When navigating the phone, you can also use the keyboard as a giant touchpad, swiping left and right when you’re hunting for a specific app, or scrolling up and down when browsing the news. Even the Key2’s spacebar pulls double duty by serving as the phone’s fingerprint reader, and it’s just as fast as any of the dedicated sensors found on computing devices. With everything TCL has crammed into this one feature, the Key2’s keyboard is much more than a set of old-fashioned buttons, it’s the heart of the device. 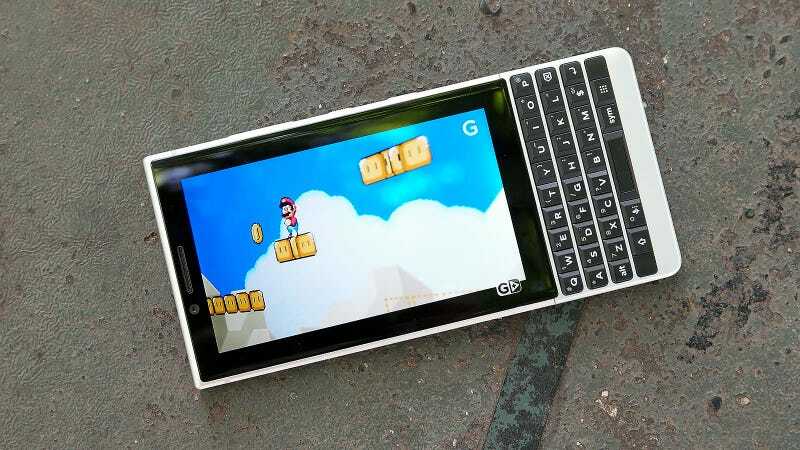 Okay, enough about the keyboard, how’s the rest of the phone? Really, it’s a bit of a mixed bag. The Key2’s 6GB of RAM, 64GB (or 128GB) of storage, and microSD card are good for business types who frequently need to switch between apps or store files on their device. However, the Key2’s Snapdragon 660 processor only offers about half of the raw performance of what you’d get from a something with a Snapdragon 845 chip, although that’s kind of to be expected since the Key2 costs a more reasonable $580. On Web XPRT 2015, which measures browser performance, the Key2 hit just 181, while Snapdragon 845 devices like the Galaxy S9 and OnePlus 6 were up in the 280s. And in terms of overall speed, the Key2 scored 5,613 for multi-core performance in Geekbench 4, versus 8,414 and 9,109 for the S9 and OP6, respectively. So don’t expect this phone to age as well with future Android updates as those more powerful devices. The Key2 is available in two colours: black or silver. The convenience key is that textured key in the middle, between the power button towards the bottom, and the volume rocker up top. Then there’s the Key2’s LCD screen, which at just 4.5-inch across and featuring an unusual 1620 x 1080 resolution that sounds like something from five years ago. With a peak brightness of 458 nits, it doesn’t lack luminance, but overall real screen real estate is the compromise you make for that physical keyboard. Now sometimes, when you’re composing an email or sending a text, that doesn’t matter since that space would just be used for a touch keyboard instead. But when I’m watching videos, I often end up with letterboxes on top and bottom that makes the display feel even smaller than it is. Thankfully, with a sizable 3,500 mAh battery, what the Key2 lacks in pure speed or pretty screen, it makes up for in longevity. It had a time of 11 hours and 17 minutes on our rundown test. That’s the same as what we got from the Pixel 2 XL, and only slightly behind the Huawei P20 Pro’s 11:36. And for those not ready to make the jump to the world of wireless audio, fear not, because the Key2 still has a headphone jack along with a standard USB-C port on bottom. Because of the Key2's awkward aspect ratio, when watching 16:9 content, the screen seems smaller than it is. And for the more mature among us worried about security, Blackberry’s DTEK app has you covered. Not only is there a new Secure Folder than can be password or fingerprint protected place for stashing sensitive apps (no one can borrow your phone and just scroll through your Instagram), the DTEK app also monitors the type of permissions other apps request, including how often they ask. So if Facebook is trying to use your camera or microphone in the background, the DTEK app will catch it, so that you can revoke access and protect your privacy with a couple quick taps. Now here comes the bad news. 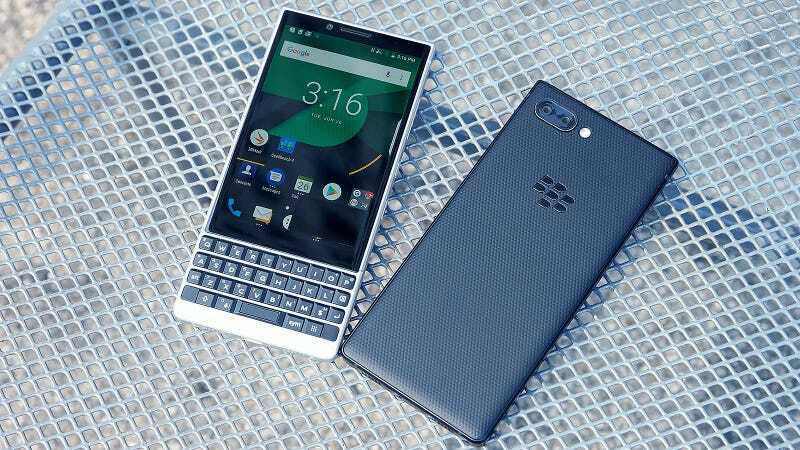 While the Key2 is the first BlackBerry to feature dual rear cameras, the quality of pictures they capture can vary from fine to funky depending on lighting conditions. 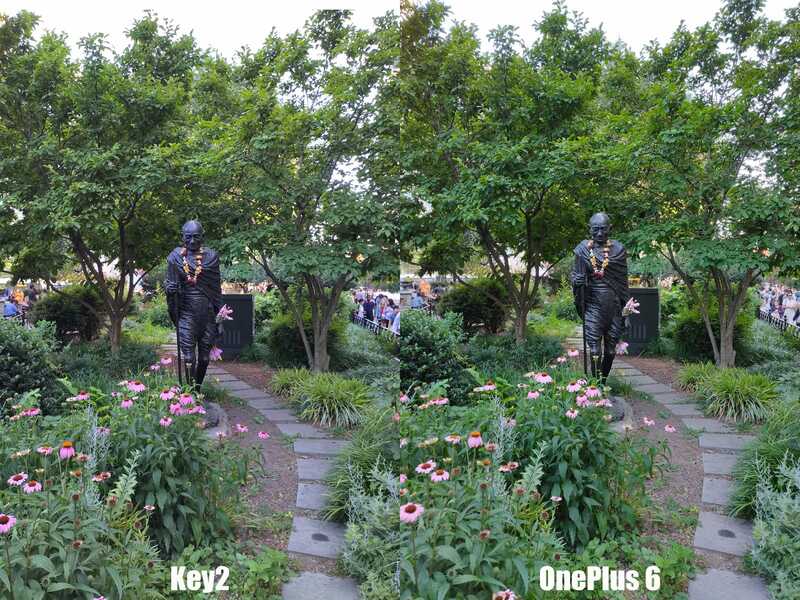 In bright light, the Key2 shoots passable pics that don’t really offend, but you can still see things like blown out highlights in a picture I took of a bunch radishes, or a general softness and less vibrant colors in a shot of a statue of Gandhi. The Key2 does relatively well in bright light, but you can still see a few blown out white spots on the radishes. in this comparison, things are pretty close, with the OP6 sporting only slightly more vibrant colours. But at night, the difference between the two phones is much more obvious. And in even darker conditions, the Key2's camera really struggles. But when the lights go down, that’s when the Key2 really struggles. Even with ample outdoor lighting, in a face-off against a OnePlus 6, the Key2’s photo lacks the rich colours captured by the OP6, has noticeably less dynamic range, and more grain. That’s compared to a phone that costs less than the Key2. In even darker conditions, the differences are quite shocking. 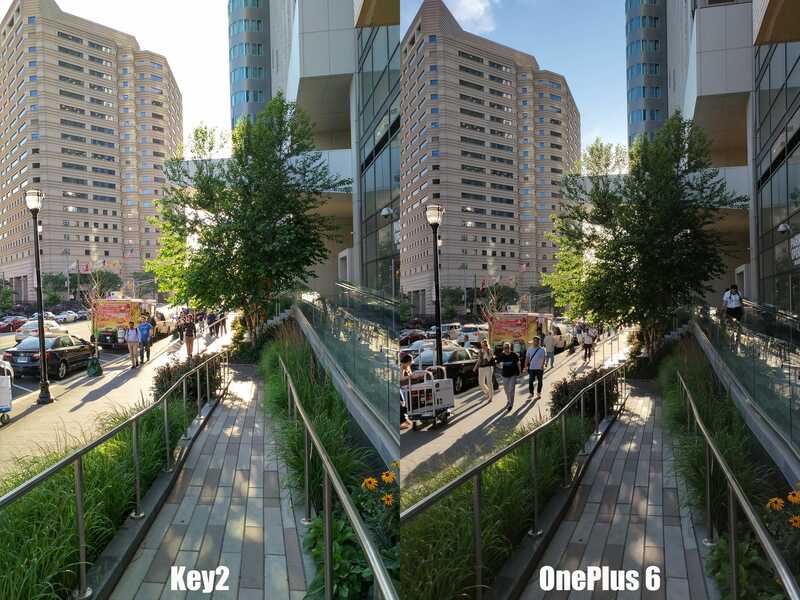 The shot from the OnePlus 6 looks like an actual photo, while the Key2’s pic starts to stray into impressionist painting territory. It’s dark, there’s almost nothing approaching what I’d call sharp, and some objects even start to blend into each other. Suffice to say, if you’re someone who likes snapping pics in poorly lit places like restaurants or bars, the Key2’s low-light camera performance could be a deal breaker. But hey, at least those dual cams give you a portrait mode right? That camera performance means your typical hypebeast or Insta-addict better stay away. Yet in a world already overcrowded with phones sporting glass sandwich designs, its so nice to have something that feels different! The Key2’s aluminium chassis is both sleek and stylish (and noticeable slimmer than last year’s KeyOne), while the soft-touch textured plastic in back is a joy to touch. 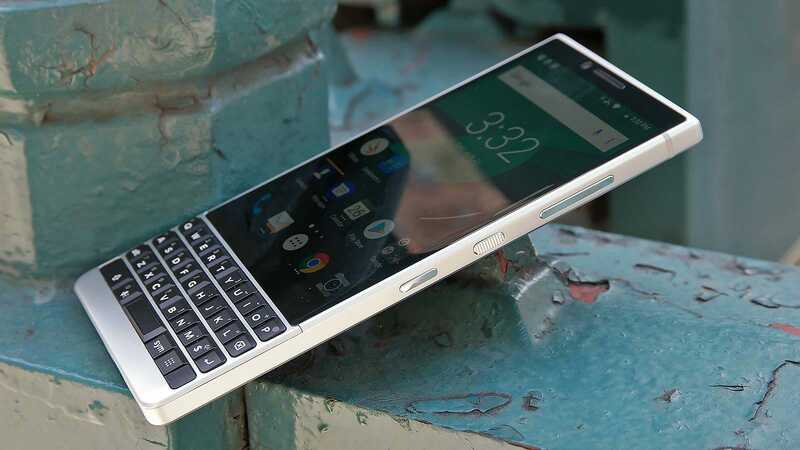 Combine that with more than solid battery life, good enough performance and a reasonable price, and the Key2 feels like it’s a phone for more than just the physical keyboard die-hards out there. While the era of the tactile smartphone keyboard is clearly over, the Key2 makes a great case for why it’s too soon for that feature to completely disappear. If touchscreens have left your frustrated TCL has provided an able solution. With a new matte texture and the addition of the speed key, the Key2’s physical keyboard is as good as it gets. At over 11 hours on our test, the Key2’s battery life is fantastic. The Key2 has a somewhat weird mix of specs, but the 6GB of RAM and 64GB of storage standard are nice inclusions for people focused on productivity. The major trade-offs for having a physical keyboard are a smaller display and no water-resistance.